Many people believe that receding gums are just another sign of aging, and there’s nothing to be done about them. While it is true that receding gums can be a sign of aging, they are not inevitable, and there are several things that can be done to prevent them or at least keep them from getting worse. Receding gums are gums that pull away, or recede from the teeth over time. More of the tooth is exposed, and eventually the root of the tooth is exposed. Not only this, but the person starts to develop pockets between their teeth and their gums. The gums should fit snugly against the tooth, and these pockets are good breeding grounds for harmful bacteria. This bacteria attacks the bone and the tissues that support the teeth and can lead to the teeth falling out even if the teeth are otherwise healthy. At this stage, the patient may need the services of a periodontist, a medical professional who specializes in gums. 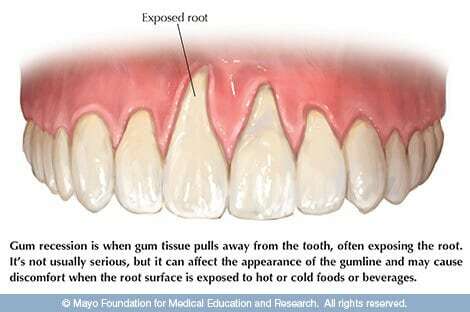 The early stage of receding gums is painless, so people who are affected don’t pay much attention to it until the roots of their teeth are exposed, and their teeth become sensitive to hot and cold. Their teeth also look longer, which gave rise to the saying “Long in the tooth.” This saying, which first applied to horses, means that something or someone is up in age. The leading cause of receding gums is gum disease, or gingivitis. This is caused by plaque, which is a viscous film of mucus, bacteria and bits of food that builds up on the teeth and attacks the gums. The signs of gingivitis are gums that are swollen and red and bleed easily. A person who sees blood when they brush their teeth probably has gingivitis. A surprisingly large minority of people are genetically at risk for gum disease, even if they do practice good dental hygiene. This is why the dentist recommends brushing with a soft bristle brush. Brushing too hard can wear down the protective enamel on the teeth, and hurt the gums. People who do not attend to their dental hygiene are more likely to have receding gums. Bad dental care allows the plaque on the teeth to harden into tartar, or calculus that can only be scraped away by a dentist, dental hygienist or peridodontist. In the meantime, tartar makes the gums recede. The sometimes dramatic swings in levels of female hormones make women susceptible to receding gums during certain times of life. Smoking makes everything worse, and this is true of receding gums. This is when a person grinds their teeth, usually at night. People with teeth that are crowded, misaligned or crooked are more at risk for receding gums. This is because an unusual amount of stress is placed on their gums and the supporting bone. Your dental team at Implantation Dental Center can help arrest early stage gum recession through scaling and root planning to get rid of tartar and plaque. The treatment not only involves removing calculus but smoothing out the root of the tooth to make it harder for bacteria to get a foothold. If the gum recession is very deep, surgery can promote regeneration. Other types of surgery to treat badly receding gums are open flap scaling and root planing and different types of gum grafts including the pinhole and tunneling technique. Regardless of your personal situation, it begins with a phone call and a consultation with our team. Our goal is to help you, so contact us today at 954-476-0770. Dental fillings: porcelain, amalgam or composite resin?